When you consider developing your sessions – and particularly your warm- ups – it’s important to consider what you are qualified (and therefore insured) to do as a jog leader. This covers organising and leading jogging sessions, using existing jogscotland session plans (which can be varied a little) or session plans prepared by a qualified coach. Delivery of the session will include a structured, dynamic warm-up and a structured cool-down, normally including mild static stretches to restore muscle length. There’s a lot of scope for adapting basic drills and stretches to meet the needs of your individual participants, so long as it’s in the context of leading a jogging session. Your jog leader qualification does not allow you to lead separate strength and conditioning sessions. If you want to do that, then the best route would be to consider the Scottish Athletics National Coach Development Programme: Athletic development and physical preparation courses, which aim to provide coaches of all levels with the knowledge and skills to develop the physical competencies, in the athletes they coach. Athletics 365 is also a great resource, and provides a series of progressive challenges that can be incorporated into warm-ups – here’s an example. However, it’s best if you chat this through with a qualified coach. 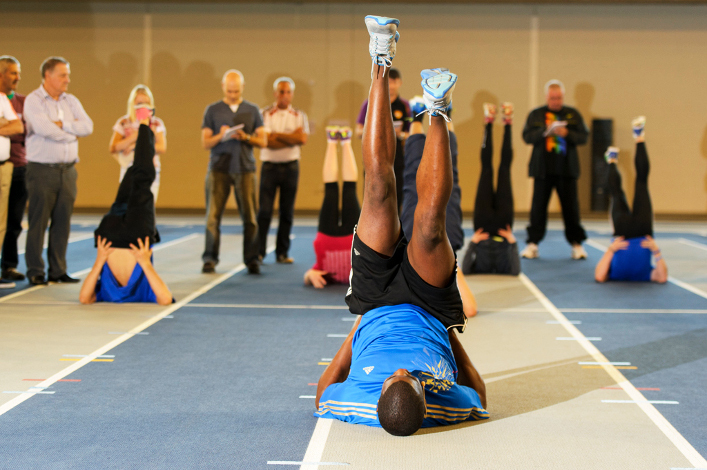 If you feel that your group would benefit from having a qualified coach involved, the Coach in Running Fitness (CiRF) is a very comprehensive qualification, delivered by scottishathletics on behalf of UK Athletics. It’s quite a step up from the jog leader qualification, as you’ll become a coach, with more knowledge to help you plan, vary, and review your own sessions, but many of our jog leaders are now taking that step. If you have any queries about further training, please contact scottishathletics coaching coordinator Alison Grey.